Trench Art is a misleading term given today to a wide variety of decorative items, sometimes also functional, produced during or soon after the First World War (though the term is also applied to products of both earlier and more recent wars). They were made in all the countries engaged in combat. Ashtrays, matchbox holders, letter knives, model tanks and planes are typically found. Often they are re-purpose lead bullets, brass recovered from spent charge cases, and copper from shell driving bands, although carved wooden and bone pieces, and embroideries are also seen. However, few examples were fashioned literally in the trenches. Nor were all made by soldiers. Upright of cross formed from two cartridges. They stand on a circular base, into which the nose of the lower cartridge is inserted. The upper cartridge is cut-off at the base and soldered to the base of the lower one. 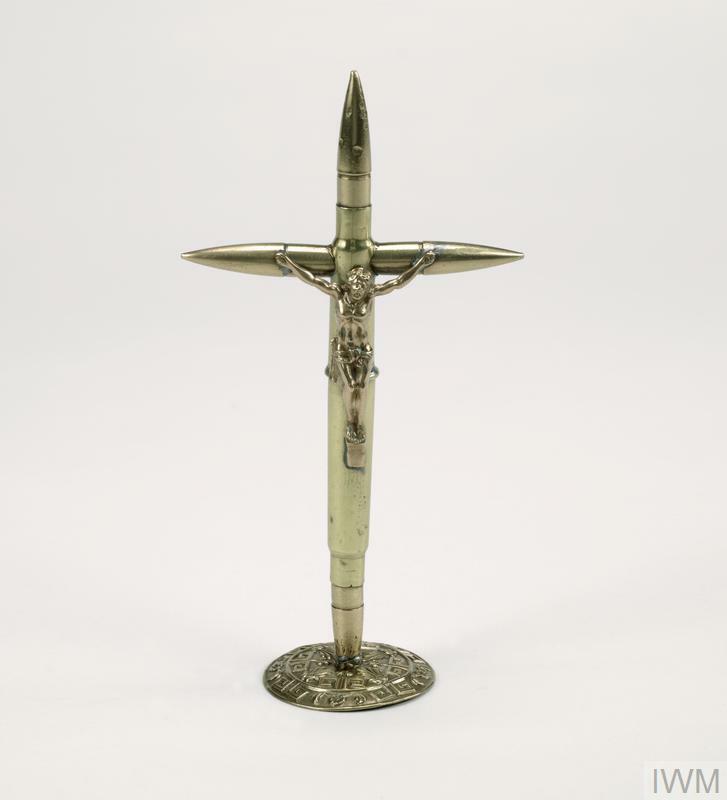 The arms of the cross are made from bullets inserted base-first into this upper cartridge case. Who might have owned trench art? Many servicemen bought or made trench art as souvenirs for themselves or as gifts for friends and family. 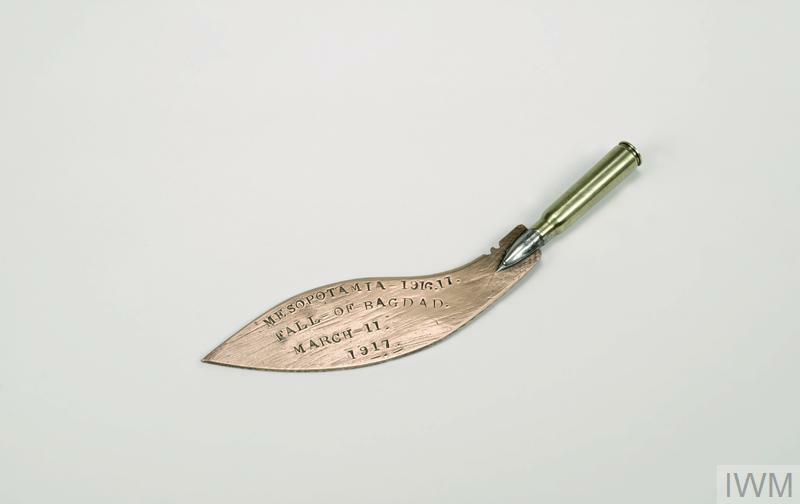 This souvenir 'paper knife' was brought home by John Denny, a Royal Army Medical Corps (RAMC) orderly who had served in Gallipoli and the Mesopotamia during the First World War Paper knives made from battlefield scrap were a common form of 'Trench Art' during the First World War. It is probable that only the very smallest bone and wooden objects were created in the front line. The source is more likely to be workshop troops behind the lines. They had the materials, machinery, skill and occasional spare time, and money could be made selling souvenirs to soldiers heading home. In France and Belgium work to make souvenirs was also given to civilians displaced by the war. 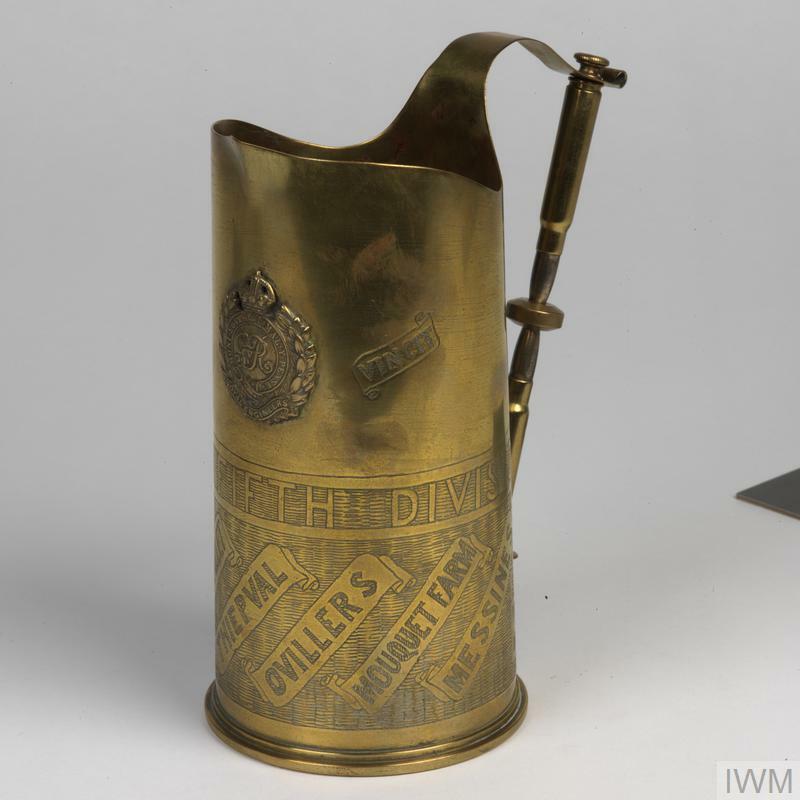 Trench art was also made ‘at home’ during the war by those awaiting call-up; also by wounded and convalescing men, for whom handicrafts involving wood, metal and embroidery formed part of their rehabilitation. And many no doubt personalised souvenirs made by others by adding inscriptions. It is tempting to think that an ancestor made a piece of trench art held by a family, but that may not be the case – there was a large manufacturing trade during and after the war. So it may have been bought – by the soldier, or by a relative on a subsequent battlefield visit. One source of trench art often overlooked was the major department stores. In the immediate post-war period they offered to turn war souvenirs such as shell fuze heads – often brought back by soldiers – into wooden-based paperweights. And if ex-soldiers had no souvenir, they could be provided. This source can be the only explanation for the widespread examples of bulkier trench art – such as dinner gongs and poker stands made from shell charge cases. These would have fitted in no kitbag. British 18-pounder Mark II brass shell case converted into a 'trench art' jug with cap badge of Royal Engineers and handle made from two 7.92mm German rifle rounds. Made by (142817) Sapper E Southgate (Royal Engineers) whilst he was manning an underground telephone exchange in the Ypres district during the First World War. Trench art continues to be made today. Across the world, and especially in Africa and the Middle East, civilians and former combatants re-fashion munitions and other war detritus to meet a tourist and export market. And in Europe (notably in France and Belgium), original First World War shell casings are still being re-worked to meet a growing trade. An example of French 'trench art', formerly the property of Private F H Warren who served in the Royal Army Medical Corps (RAMC) during the First World War. Wikipedia entry giving a good overview of the subject. The main easily-found source, combines both historical introduction and a collectables guide; includes a list of other relevant websites. Large encyclopaedic volume – the only one. Illustrated examples, in a wide-ranging book. Illustrates trench art, and much else besides. Contains details on the markings typically stamped on fuse heads, shell charge cases, bullet cases and grenades, from UK, France and Germany, often incorporated into ‘trench art’; p1–94. A Service Medal is awarded to all those who meet a particular set of criteria. These criteria are usually that an individual has served in a specific area, usually for a specified minimum time between set dates. Soldier's Demobilisation Account. IWM (Documents.9603). Demobilisation Papers were issued to every soldier after they were demobilised (taken out of active service) at the end of the war. Any soldier who was still serving at the end of the war would have received these papers.